You may remember Niki and Steve from the silly and sweet engagement shoot that Josh and I (Kelley) did with them a couple months back. During that session, Josh and I told you all about how much these two love to have fun and laugh at life. Their wedding day was no exception to this rule. From the first moment they laid eyes on each other on the wedding day, they were making each other laugh. And boy was he right, Niki made an absolutely stunning bride. And of course, the groom was looking pretty good on their wedding day as well. After a few teary and love filled minutes, these two were right back to their wonderful silly ways. Clearly, Niki and Steve’s friends share their love of silliness and laughter. This may have been one of the most fun-filled bridal parties that we’ve ever worked with. Josh and I had a blast hanging out with them all day long. Niki and Steve’s ceremony was unique in that it wasn’t just bringing these two together as man and wife, it was bringing together a whole family! To symbolize this, Niki and Steve included all three of the kids in their sand ceremony and had a family dance during the reception. The entire wedding was wonderful, but I would have to say that the family dance was one of the sweetest parts of the day. After all that sweetness was over, the open dancing began! With how much these two love fun and silliness, you KNOW there was hardly a second when the dance floor wasn’t filled with people shaking, grooving, and laughing until they cried. It is beyond clear that Steve and Niki are going to have a life together that is full of joy. Josh and I are so happy that you two crazy kids found each other! 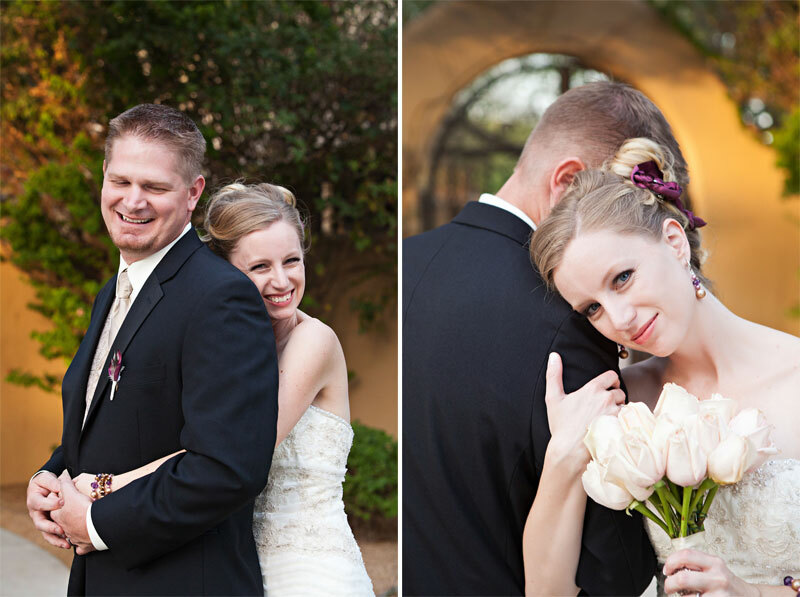 Click to see the rest of the photos from Niki and Steve’s Sweet and Silly Wedding. Meet Zach, one of Arizona’s newest high school graduates. That’s right, he has finished up all of his IB exams (this guy is SMART), thrown his silly cardboard hat up in the air, and is ready to start his future as a genuine college student. As soon as Zach’s exams were over, Josh and I (Kelley) met up with him for his “I’m FREE, I’m FREE!!! AND I’m going to college!” session (AKA senior session). Now, Zach’s not going to be just any college student, he’s going to be a Pepperdine University student. And, in case you weren’t already jealous enough, he’s going to be attending classes at the Malibu, CA campus! Josh and I wished Zach luck when it comes to deciding between studying and heading out to the beach. He was thankful for the well wishes and pretty sure that he was going to need them. Luckily, it is possible to study WHILE at the beach. I can see it now, come September, Zach’s going to be relaxing on a beach chair, bible in one hand, textbook in the other, and the latest copy of The Wall Street Journal laying across his lap. That may not sound incredibly relaxing for some of us, but I’m guessing it would be just about the perfect day for Zach. The fact that he chose to bring his Bible to his session shows how important his faith is to him, and I’m sure it’s something that will remain important while he attends Pepperdine (a Christian university). Zach is also extremely interested in business management and enjoys all things money and finance related. It’s true, where many of us may have cringed and perhaps even cried through math classes (okay, maybe that was just me), Zach does well in them and enjoys them too! I’m a big proponent of doing what you love, so if numbers are Zach’s thing, I say, “Go for it!” We need more people like him to balance out the people like me who run away when numbers pop up! Zach is the second son that his parents are sending off to college in California, which means that his little sister will now be the only kid left at home. You can tell they’re going to miss each other. Still, she assured Zach she’ll be calling him for help with her math homework, so they’ll be staying connected for sure! Zach, I hope you completely LOVE your next four years at Pepperdine! Enjoy the beach, enjoy the books, enjoy those math classes, enjoy helping your little sister with her math homework from hundreds of miles away, but most of all, enjoy the entire college experience. You’re going to do great! Click to see the rest of the photos from Zach’s Senior Session. Dear friends, this is Sam. I know, I know, gorgeous right?! As soon as Josh and I (Kelley) met up with her for her senior session, I asked her if she was nervous to be in front of the camera. “A little”, was her response. Well, apparently she was good at hiding the little bit of nerves she had, because she did amazing and looks completely confident in all of the shots! After talking about locations for the shoot, Sam decided that she’d like to take her senior photos in downtown Phoenix. What a wonderful decision that was! Luckily, when you’re downtown, all of the tall buildings do a great job of blocking the wind, so we were able to forget all about the breezy day and get some awesome photos. During the session, Josh and I talked with Sam and learned that she’s going to be a fellow Sun Devil soon! In other words, she’s about to start attending the best school ever! (We can’t help it, Josh and I LOVED our time at ASU). However, it seems that Sam’s home is a house divided. You see, her father has a mantra that goes something like this, “Sparky is bad. Wilbur is good.” Yup, he’s a die hard U of A fan. Lucky for Sam she’s not the first one in her family to dip her toes into the enemy waters of ASU. Her older sister is already attending ASU, so hopefully her dad has had time to warm up to the idea of having Sun Devils in the family. Sparky and Wilbur aside, I’m sure your parents are beyond proud of you Sam. After talking to you during your session, Josh and I could both tell that you’ve got a good head on her shoulders, and you’re going to do great things in the future. Congratulations on your graduation, and good luck with your future at ASU! Click here to see the rest of the photos from Sam’s Windy City Senior Session. Josh and I (Kelley) first got to know Kim and Tru during our initial meeting at a Starbucks, and from the moment we met them, we knew we wanted to be a part of their big day. It may sound cheesy, but Kim and Tru are some of the nicest and most genuine people we have ever had the pleasure of knowing. As soon as you meet them, you feel like you’re friends. During that first meeting they told us all about how they met, how much they loved each other, and how excited they were about getting married. Josh and I couldn’t help but be excited for them too! So, when their big day finally came, Josh and I were thrilled to show up and capture all of their special moments. Moments like reading the sweet notes that Kim and Tru wrote to one another. And smiling anxiously in those few moments right before the ceremony began. Tru kissing Kim for the first time as husband and wife. Or laughing out loud as they busted out some silly moves on the dance floor. Each and every moment of their wedding day was genuine, including the moments that Kim and Tru shared with their friends and family. Real moments like bridesmaids laughing together before the wedding started. Enjoying father/daughter and mother/son dances. And, one of my favorite moments of the night, Tru dancing to “Rhinestone Cowboy” with his grandmother. Apparently, when Tru was a little boy, he really wanted to dance to this song with his grandma. So, one day while at an event, they put the song on just for them, and little Tru, too shy to dance in front of everyone, left his grandma all alone on the dance floor. Tru decided to make it up to her and finish that dance on his wedding day. It may have been one of the sweetest things ever seen. While witnessing all of these moments (and many more), Josh and I realized that Kim and Tru are an even better match than we first thought. Not only do they love each other, but they are willing to share their love with the wonderful friends and family that surround them. With that much love and happiness floating around, we know that Kim and Tru are going to fully enjoy the new life that they have started together. Congratulations you two, and thank you so much for letting me and Josh be a part of your wonderful wedding day!